For my birthday last month, a friend and fellow manga and anime fan gave me the first installment of a manga called Nightschool. As she knows me and my type of nerdiness really well, I knew this story was going to be right up my alley, and I couldn’t wait to read it. My hopes for it were more than fulfilled, and I’ll definitely be adding the rest of the series to my collection soon. Nightschool is written and illustrated by Russian-Canadian comic artist Svetlana Chmakova. The first volume was released in 2009, and the very short-running series has just four volumes total. Unlike most manga, it was originally written in English rather than Japanese; it’s part of a relatively small but growing collection of manga written by English-speaking authors who are inspired by the traditional Japanese style. 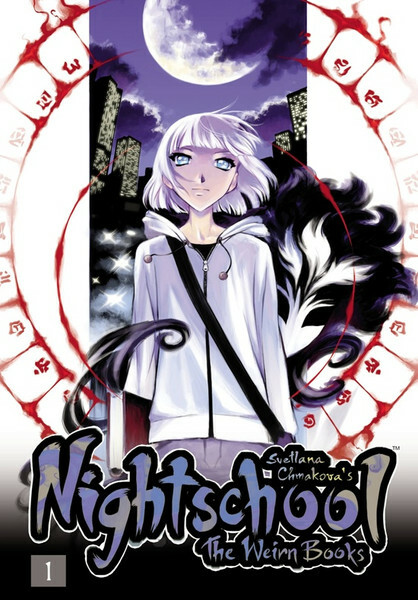 Much of Nightschool’s story takes place in a high school that appears to be an ordinary by day but transforms at night into a school for students with a more supernatural bent than your typical teenager. The attendees of the night school are beings like vampires, shifters, demons, seers, and weirns (a sort of witch with strong magical powers who always has an astral familiar by their side), all of whom attend the school in order to hone their abilities and magical knowledge. The protagonist of our story is Alex, a young weirn who learns her craft as a homeschool student. The reasons why she is homeschooled are only alluded to in the first book of the series, but it’s pretty clear it isn’t because of something good. Though Alex stays home, however, her older sister and guardian, Sarah, goes to the night school each evening—not as a student but as a faculty member. Sarah acts as Night Keeper of the school, assisting in student/teacher relationships, helping with management around the school, and generally putting out fires (sometimes literally). Things seem to be going along normally at first, or at least whatever approximates normal in this magical alternate reality, but everything begins to change over the course of one fateful night. Alex heads out for a nighttime walk, which is against the rules her sister has set for her, and has a run-in with a group of older night-school students. They are out hunting rippers, a sort of fallen vampire that feeds on life force instead of blood. But soon after the group confronts her, Alex suddenly finds herself back at home, with no memory of what happened or even how she got back. So what really went down? What does it mean for Alex and her mysterious powers? Did she do something that will come back to haunt her? Or did she just imagine the whole thing? As soon as I finished the first book, I knew that reading the rest of the series would be a must. Volume 1 does a great job of setting up the world of Nightschool; it very quickly feels immersive, and the characters are depicted in such a way that I felt I knew them well based on relatively short moments of insight into their personalities. Throughout the story, the author skillfully suggests a lot but reveals little, and while I savored the first book, it mostly left me wanting more. I’ve spent some time theorizing about the many questions the ending left unanswered and am looking forward to see what direction the story will take out of the many possibilities. The story is my favorite sort of urban fantasy: one that includes a lot of the familiar legends and tropes but reworks them in a way I’ve never seen before. I love this sort of story because it gives me more of something I already know I enjoy but breathes new life into it, making those old story features feel fresh and new. It’s a combination I can’t get enough of, and one I was happy to find in Nightschool. So far, I really only have one main critique of the story. In spite the good pacing and the way the characters are efficiently yet effectively rendered, it could be said that the story leaves too many questions hanging. In some ways, it feels like the first book isn’t doing a lot beyond some loose worldbuilding and a good deal of setup for the rest of the series. Despite that, though, I enjoyed the atmosphere of the story too much to be bothered by this, and it mainly served to heighten my excitement to read the next three volumes. I can’t wait to find out what happens next in this series, and I’m grateful to my friend for turning me on to it. Few things are better for a manga fan than being introduced to a series that a fellow fan loves and coming to love it yourself! I’m excited to dive back in to the magical, mysterious world of Nightschool, hopefully very soon.